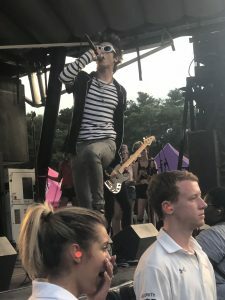 The music, the bands, and the crowd-surfing – Van’s Warped Tour has been a punk, emo, and alternative rock launching point since 1995 for many of the greats like Joan Jett, Paramore, Katy Perry, and of course, the now disbanded cultural motif that was (and still is) My Chemical Romance. As the final cross-country run is currently about to wrap up at the end of this summer, I figured that I just had to attend the Mansfield, MA date at Xfinity Center to be able to say I did – as any self-respecting punk kid has to have been to Warped at least once. At this point, I am sad to say that once is all I got, since I didn’t fall head-first into the alternative rock territory until the end of high school, and there just haven’t been enough bands that I knew there – but now I’m all into it, and absolutely obsessed with the depth of the music in this genre, as well as the very talented and down-to-earth people that produce it. So, decked out in my Converse and MCR tee, armed with my (clear venue-approved) backpack and chilled water bottle, I headed off to the festival on July 27th with my friend by my side. 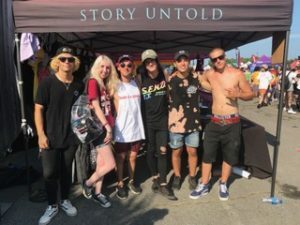 We were both completely inexperienced with Warped Tour and figuring out the ins-and-outs, but I’m pleased to say that things panned out relatively how I wanted them to. I did my homework beforehand and figured out how to find set times and meet and greets (which are completely unannounced until the day of). I even prepared myself to dodge mosh pits (as I’m just not into that aggressiveness myself and would probably get trampled otherwise) and avoided getting kicked in the head by crowd-surfers (well, I nearly did once, but I survived). Being a very type-A planner myself, I was less than thrilled with having to scramble to figure out what sets I wanted to see and when, but I was so energized by the excitement of the day that it ended up not really mattering to me all that much. I ended up getting to meet (and bring handmade gifts to) pretty much everyone I wanted to, and I squeezed in a handful of sets and extras around that as well. Overall, I got to meet techno pop punk alternative band Waterparks, French-Canadian pop punk band Story Untold, and fashion art rock band Palaye Royale. I also watched a couple extra sets, like Mayday Parade and The Maine, which I did enjoy even though I wouldn’t consider myself to be a super fan of them as I was the aforementioned bands. Below, I’ll break down the scoop of my favorite bands – all about their sets, what meeting them was like, and their overall style and presentation. 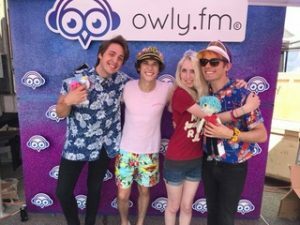 Waterparks consists of frontman Awsten Knight, guitarist Geoff Wigington, and drummer Otto Wood (there’s no bass player, as they’re just really not into that for some reason). They are three very zany, unique, and thoughtful guys who aren’t afraid to be themselves and push the boundaries with their music. As Awsten recently went through a pretty difficult breakup, fans have been speculating about nuances in their latest album, Entertainment, because there are a lot of layers and bizarre moments in both the songs and the concept videos (the latest one featured a zombified-version of himself after falling out a window). He’s just a really deep guy, and between being very emotionally inclined (dare I say, “emo”), he also has something called synesthesia, which causes him to associate colors with sounds, feelings, and words. This is very prominent in his lyrics, which are also often super snappy and to the point. An older song of his off of Double Dare, “Little Violence” features the very slick lyric: “I said I’m stealing rock back / So take off with your snapback / Before you get knocked flat”, which I think is incredibly clever. And this new album, Entertainment, carries those feelings and cogent ideas a step further, with one of my favorites off the album being “Blonde”. 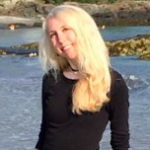 “Blonde” proclaims: “At least it’s all about you / I think the blondes are done with fun”, which could be a jab at an ex-girlfriend, but the findings are inconclusive. 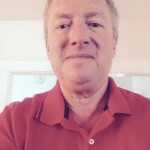 The musicality of the song consists of a driving electric guitar rhythm in collaboration with a constant, prominent drumbeat and some synthesized keyboard notes floating in the back. Awsten writes and mixes a lot of the music himself, which I find quite impressive since I would be absolutely clueless trying to do any of that (despite my ten years of guitar lessons and intermediate theory instruction). 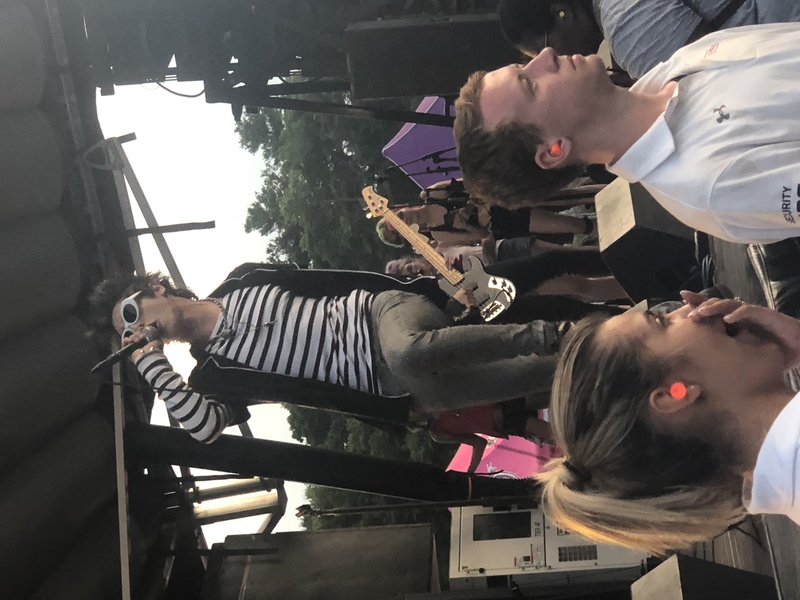 During the part of their set that I was able to see before running off to the next one, they also played a couple more songs off of Double Dare– Awsten’s personal favorite “Take her to the Moon”, as well as “Crave”. Both songs are sonically different from each other, and yet everything on that album feels cohesive, perhaps with the common thread of the electrified elements running through it, like the ever-present synthesized keyboard or the electrified beat pulsing. Awsten is as pleasant as he is intelligent, as I quickly found both when I met him as well as when I attended his backstage TEI (The Entertainment Institute) session. He gave me the nicest hug I’ve received in a while, and seemed quite thrilled with the handmade doll I gave to him. His TEI session was… interesting, I’d say. He invited participants to walk up and try handfuls of good and bad-tasting jellybeans simultaneously and then to describe what they tasted like, before downing the rest of the container himself (over forty beans, I believe). Then a hidden red rose was found in exchange for social media follows, and a very creative TED-type talk was given about why soda is actually water (yeah, I got nothing. 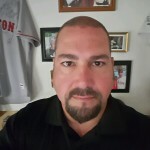 I mentioned this guy was a character). I first heard of Story Untold a couple years ago (back when they actually called themselves Amasic) while I was falling down a YouTube black hole and stumbled upon the best punk cover of Taylor Swift’s hit song “Style” that I had ever heard. It was completely reimagined as a pop punk masterpiece, with a faster drum beat, and a near-constant electric guitar accompaniment. Since then I fell in love with the band (and admittedly, a bit with the dynamic and talented frontman, Janick Thibault). When I heard they were going to be at Warped, I knew I had to add their set and meet and greet to my wish list, and it was so worth my while. 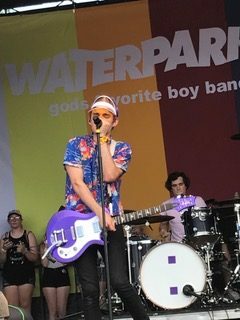 Even though I had to run to see them halfway through the Waterparks set, I had a great time and got to hear a handful of their songs. Story Untold is comprised of frontman Janick Thibault, lead guitarist Jessy Bergy, drummer Jonathan Landry, and bassist Aiden Von Rose. They’re from Quebec, so they have amazing French Canadian accents, which aren’t totally noticeable in the music, but I’m convinced that it gives them a unique flair that just isn’t present in other punk bands. Stylistically, they are often compared to All Time Low (the front man of which Janick bears a striking resemblance) as well as Green Day. 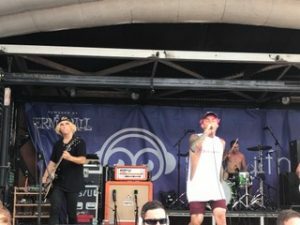 At Warped Tour, I got to hear their Rock Alternative Version of their typical 4 Chords mashup arrangement, consisting of bits and pieces of songs from other great bands like Green Day, Paramore, Sleeping With Sirens, Linkin Park, Simple Plan, and more. The guitar riffs remain relatively similar and constant throughout, with only subtle nuances to change up the feel of the songs while remaining within the same four chords (and thus, the same key). I also got to hear a few of their original songs, two of which are off of their latest album Waves– “Delete” and “Drown in My Mind”. These two songs have to do with both finding internal peace, both emotions and in the wake of a ruined relationship as seen in “Delete” – “Oh we used to feel the same / now we’re breaking like the waves in California / everything we had just feels like a dream / now you’re just a photo on my iPhone screen / and I don’t wanna hit delete.” This band is extremely relatable, and that truly shows in their music. I also heard their older song “History”, which is a song more toward power-pop with its encouraging tone and energetic chorus featuring dense guitars layered over a prominent drumbeat. Meeting them was awesome because Janick immediately said to me “Oh, I know you!” (likely from seeing my Instagram posts). It felt pretty amazing that this talented guy I fell for through his music actually recognized me in person – and he promptly hugged me and commented on my thoughtful gift. I also chatted a bit with Jessy, whom I complimented on his playing and mentioned that I play guitar too. He smiled and agreed that playing guitar is hard, but that it gets better. Earlier that morning, I also saw Aiden at their merch tent, and he gave me a hug and said hello as well. Overall, there’s something so satisfying about the bands that turn out to be really great people as well as musicians – and I think Warped Tour completely embodies and fosters the connectivity between artists of all levels and their fans, which is pretty awesome for today’s youth culture. Fashion art rock band Palaye Royale is made up of three brothers: frontman Remington Leith, guitarist Sebastian Danzig, and drummer Emerson Barrett. Contrary to what I originally believed, they do not have different last names – rather, they use their first and middle names on stage, likely to differentiate themselves from each other stylistically (but their legal last name is Kropp). Stylistically, they are similar to My Chemical Romance, even known for their epic cover of the cult classic hit “Teenagers”. Remington’s voice features the same raspy drawl that Gerard Way has popularized, and paired with the band’s emphasis on dramatic stage makeup, and emo fashion mixed with vintage Victorian styles, the band is bringing about a new wave of stylistic energy to the “scene” scene. The band also played their newest single “You’ll Be Fine” ahead of their release of their next album, Boom Boom Room Side B, featuring the catchy high-octane hook: “I’m lookin’ for you out there / I’m looking for truth inside your stare / I’m looking for you outside / ‘Cause I mean it, yeah I mean it, you’ll be fine.” The dramatic energy of this tune mixes with the dark vibes of the undercurrent just below the surface of the beat, and it only gets stronger as the tempo erratically increases throughout the course of each pre-chorus. This band is one of the best I’ve seen in a while, as their songs are well written and smart, both sonically and lyrically, with compelling hooks to draw listeners in from far and wide. Another song I heard them sing live at the festival was “Mr. Doctor Man”, which begins with a prominent bass lick, which carries through much of the song. By the time the pre-chorus ends, the bass and guitars give way to new rhythms and vibes as Remington proclaims “Honestly it’s running through my veins you see / I don’t need their surgeries / I just need to breathe / they’re coming after me.” At the bridge, the temperature drops considerably, as everything momentarily congeals into almost a doo-wop feel until the final chorus kicks in. With dynamically–rich songs, Palaye Royale is one band to put on your watch list for sure. 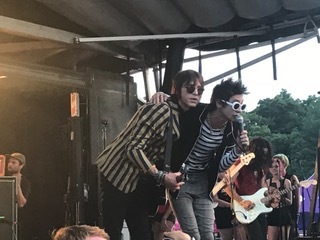 Their on-stage presence is something for the books as well, as Remington jumps around everywhere, climbing on the rafters and sometimes even hanging upside-down, or even crowd surfing, sometimes on an inflatable raft while singing. I didn’t get to meet the whole band because it was the end of the day and everything was getting a bit rushed, but I got to chat with Remington for a few minutes, and he was really very sweet. 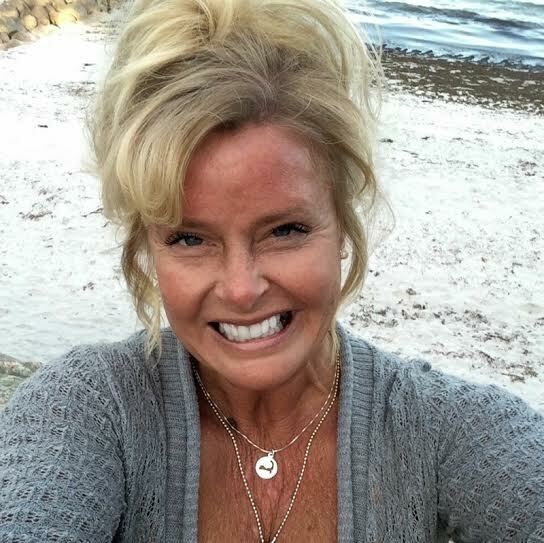 The crazy energetic guy I saw on stage seemed gone, and left over was a sweet person who was so happy to receive my thoughtful gift and give me a nice (albeit sweaty) hug. It was interesting how the stage persona evaporated as soon as the performance ended, but I suppose that makes sense. After all, so much about life is just a performance. It’s those moments when we can truly be ourselves that the real magic happens. For the past twenty-three years, Warped Tour has been a massive meeting place for fans and artists alike, and it will be sorely missed. The administrator of Warped Tour, Kevin Lyman, has alluded briefly to some possible off-shoots of the famous Warped Tour in the future, but probably never something this big and epic ever again. It’s a sad thing to lose, but I consider myself lucky that I got to experience it at least once – and this last one is definitely one for the books. Until then, I’ll just keep on rocking and hope that I’ll get to see my favorite bands again soon some other way.